Clearing debris off the beach can increase the number of sea turtle nests by as much as 200 percent, a new study shows. Leaving the detritus decreased the number by nearly 50 percent. Sea turtles are classified as either endangered or threatened, depending on the species. Restoring their nesting habitats is critical to keeping them alive, says Ikuko Fujisaki, the study’s lead author and an assistant research professor of wildlife ecology and conservation with the University of Florida Institute of Food and Agricultural Sciences. With humans encroaching on their natural habitat, sea turtles face an uphill climb to stay alive, says Fujisaki. Sea turtles spend most of their lives in the sea, but they rely on sandy beaches to reproduce. From May 1 to September 1 of each year, from 2011 through 2014, Fujisaki and her colleagues conducted an experiment along the Gulf Coast near Eglin Air Force Base in the Florida Panhandle. They sought to understand the effects of large debris on sea turtle nesting activities. The study area has one of the highest nesting densities of loggerhead sea turtles in the northern Gulf of Mexico. The debris in the area were both natural, such as fallen trees and stumps, and human-made, including concrete, pipes, and metal fencing that remained on the beach after old military structures were demolished. 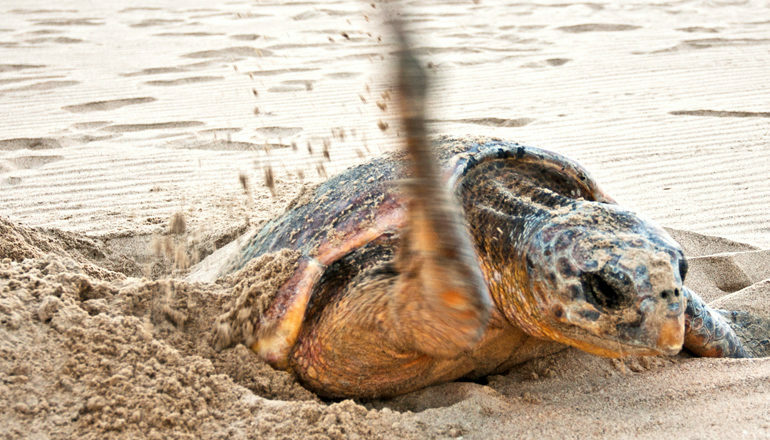 During the experiment, researchers recorded locations of nests and false crawls, defined as the number of times that sea turtles emerge from the Gulf waters but do not lay eggs. Researchers also removed large debris. They found sea turtle nests increased where scientists removed debris. After researchers got rid of debris, sea turtle nest numbers increased 200 percent, and the number of false crawls increased 55 percent, the study showed. In beach sections where debris was not removed, the number of nests declined 46 percent. “Our results showed that the presence of large debris on a sandy beach could alter the distribution of sea turtle nests by influencing turtle nest site selection,” Fujisaki says. Fujisaki’s findings appear in the Journal of Experimental Marine Biology and Ecology.